The emergence of new signal transport protocols and standards and the embrace of new methods of interfacing are changing the way communications are being handled for broadcasters. Increasing implementation of Audio Video Bridging (AVB) and the growing need and acceptance of remote mobile connections to intercom systems are just two examples of how broadcasters are taking advantage of new technical advances to realize greater efficiency and flexibility in planning and using these systems. The AVB standard provides for the synchronous, real-time, low-latency delivery and guaranteed bandwidth of broadcast signals over AVB-enabled Ethernet networks. Broadcasters and other media companies are embracing this standard in large part because it is an IEEE standard that relies on established Ethernet standards. The AVB standard is uniquely qualified to serve as a backbone for broadcast signal transport because it takes advantage of the Ethernet networks and related components that today are familiar within broadcast operations. Because AVB is built on a solid foundation and is part of a well-defined and continually refined body of standards, AVB-enabled infrastructure and hardware investments offer users an array of benefits, along with peace of mind. In an AVB-networked solution, intelligence operates in the background to ensure that the signals are directed along the shortest possible path, both to minimize latency and to make sure there is enough bandwidth along that given path to guarantee safe transport of those signals. However, one of the greatest benefits of working with an AVB network solution is that, as a backbone architecture, it scales very well. Harnessing the power and convenience of AVB for intercoms became a natural next step. The new CPX-AVB expansion card for the Riedel Artist 1100 series control panels is Riedels first AVB-enabled keypanel, and it provides the next generation of AVB interfacing for Riedel Artist digital matrix intercom control panels. Fitting into the expansion slot of the Artist 1100 series OLED control panels, the CPX-AVB card turns the control panel into an AVB-enabled device, making its ports available within the entire AVB network. The expansion card converts two Artist ports to the AVB network and vice versa. Once installed, keypanel operation is identical to that of a conventionally connected panel. While the use of AVB-enabled networks is easily leveraged to handle the needs of intercom systems, the introduction of control and management capabilities on popular handheld devices is making it easier to work with those signals in real-world applications. 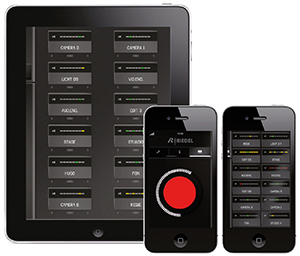 Riedel is also using this advance to extend the value and utility of its Artist digital matrix intercom system. A new app from the company enables use of compatible iOS, OS X, and Android devices as full-featured 12-key virtual panels for any Artist system. The option of using smartphones and tablets as intercom interfaces provides another compelling reason to work with the Artist intercom product, as users on the move can maintain communications at all times. Operating the apps virtual key panel via the devices touch-screen interface, users enjoy the same signaling capabilities as they would on Riedels 1000 Series wired control panel for Artist systems. Like the wired control panels, the new key panel app can be configured via Riedels Director software. To facilitate mobile control over the Artist system through the new app, a VOIP-108 G2 card at the Artist frame converts eight Artist matrix ports into a compressed IP stream. To assure excellent audio quality at all times, users can choose between two modes a high-quality mode with an audio bandwidth of 6 kHz, resulting in a data rate of less than 80 kBit/s (including panel data) and a low-traffic mode with 4 kHz audio bandwidth and a data rate of less than 40 kBit/s per channel (including panel data). The VOIP-108 G2 client card then communicates with the virtual panels via a WAN connection to a wireless network. As the demands of production grow ever greater, Riedel works to offer solutions that enable flexible yet reliable communications. Incorporating the latest technology into its products, the company provides its customers with smarter options for handling the complex task of managing communications systems of any size.